What's your training style at your pizzeria? Do new hires follow a training manual and specific steps to learn their new job or are they thrown to the wolves? 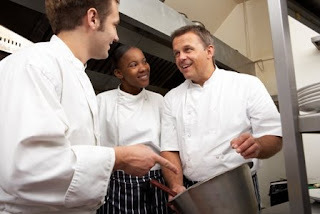 In order to properly learn any task in a pizzeria, trainees usually need to go through a series of steps, which include, but are not limited to: demonstration of the task; shadowing another employee; verbal or written instructions; trainer supervision while performing tasks; and role-playing, with the trainee performing duties while the trainer acts as the customer. Many new trainees have never worked at a pizzeria before--or anywhere! The most important place to start is with safety (i.e., handling food, emergency situations, kitchen equipment safety, slip and fall avoidance, etc.). Patience is key when trying to determine which learning style works best for each person. It's important that all employees are trained on the same tasks and skills--and consistently--especially since many of them will be training each other. Assigning mentors or "buddies" to new employees can also boost the morale of your current staff, showing them that you trust them enough to train a newbie. And don't restrict training to the new hires. Refresh the skills of your more seasoned employees every six months, or as needed. These periodic trainings can include customer service improvement, menu upsell techniques, and training to move into other positions at the pizzeria. So what's your training style? Let us know in the comments section below.